A community of German Reformed farmers purchased a three-acre plot of land from Sebastian Royer in 1747 to build a church. The informal congregation originally gathered in a log cabin. This wooden building also served as a hospital for Revolutionary War Soldiers, some of whom lie in unmarked graves in cemetery. The present brick building was constructed in 1813 by Emanuel Deyer. Jacob Hollinger, a member, furnished the bricks. The hand-carved communion table in front of the pulpit was crafted by Wendel Laber in 1743. In 1752 the congregation’s first ordained minister came from Germany to serve a congregation of approximately 60. Approximately 22 pastors served Old Zion, along with a number of other churches in the surrounding communities. From 1870 to 1891 the congregation grew from 225 to 385 members. By 1906 the congregation dwindled to 34 members. From 1948 until 1952, the building and grounds deteriorated without a congregation. The Men’s Brotherhood of St. Luke’s UCC in Lititz initiated repairs and maintenance of the building and property. In 1958 the interdenominational board of directors of Old Zion was organized. 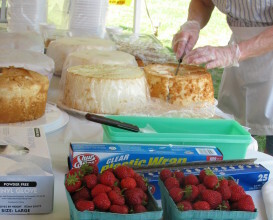 Although Old Zion Church is no longer served by a congregation or a minister, the board of directors sponsors several events throughout the year to raise funds for the maintenance of the property including a Strawberry Social and Carol Sing. The church is also available for weddings, funerals, tours, and as a special meeting place for organizations or church congregations.